Hi Everyone! 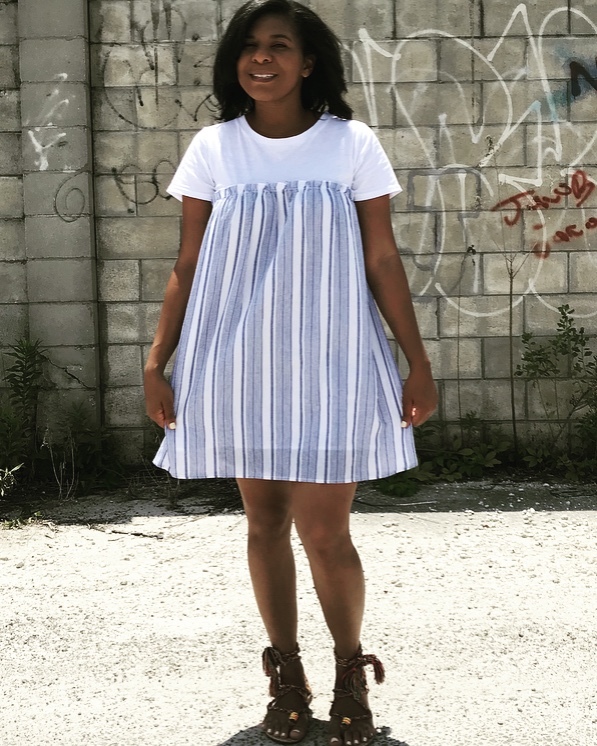 Today's post is about the easiest summer dress ever! There are so many things to like about this dress. I love the contrasting material, t-shirt up top and then striped the rest of the dress. It is a baby doll style dress so the fit is roomy while still being cute. I love that you can pair it with sneakers, heels or sandals as I did today. The sandals are from Sam Edelman's Circus line. They are so comfy and the multi-color lace up strings are the cutest. I wore them all day and my feet didn't hurt at all. Click the link below the first picture if you would like to purchase. I think they are perfect for summer and can be paired with dresses, shorts or skirts. I love the tassel detail and matching it with other prints. It's funny I had this dress on all day while doing Mother's Day shopping with my sandals and I changed to heels for a housewarming party I had this evening. This dress is SO versatile. I love it!! I hope everyone has a great night.